I just wanted to highlight, very quickly, a great etsy seller, branchhandmade. They screenprint clothes and homestuffs with nice images. 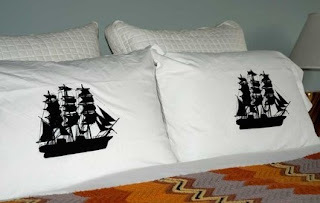 I've bought two items from them, these pillowcases (with ships!) and a cardigan with a bi-plane on it, which has quickly become a wardrobe staple for me. Best part? Their prices are relatively affordable and the quality of the fabric of both the pillowcases and the cardigan is very good. I'm pretty sure they use all organic materials. Anyway, check em out! I've been eyeing some other items from them for holiday gifts (is it that time of year already??). I love their whale and giraffe print t-shirts!